Large movements of refugees and migrants around the world since 2015, many in response to humanitarian crises, have led to a global negotiation at the United Nations (UN) to create a new Global Compact for Migration (GCM). The GCM will be a non-binding international agreement to establish a new regime for cooperation on international migration that can maximize the benefits of migration and better protect migrants in vulnerable situations. While governments—minus the United States—continue to negotiate the GCM, it’s important to step back and reflect on the lives at stake. The latest UN report and data on migration from the UN Population Division helps by providing a snapshot of migrants around the world. These data can assist policymakers who are currently negotiating the GCM’s substantive provisions, who should remember to take into account their special responsibilities to protect the human rights of all migrants who live and work within their borders. By continent, Asia hosted 80 million international migrants, Europe 78 million, North America 58 million, Africa 25 million, Latin America 9.5 million, and Oceania 8.4 million. Europe’s population would have declined between 2000 and 2015 had it not been for the arrival of international migrants. Middle-income countries such as Mexico, Morocco, and Turkey had 32 percent of the world’s migrants, and low-income countries from Bangladesh to Zimbabwe had four percent. 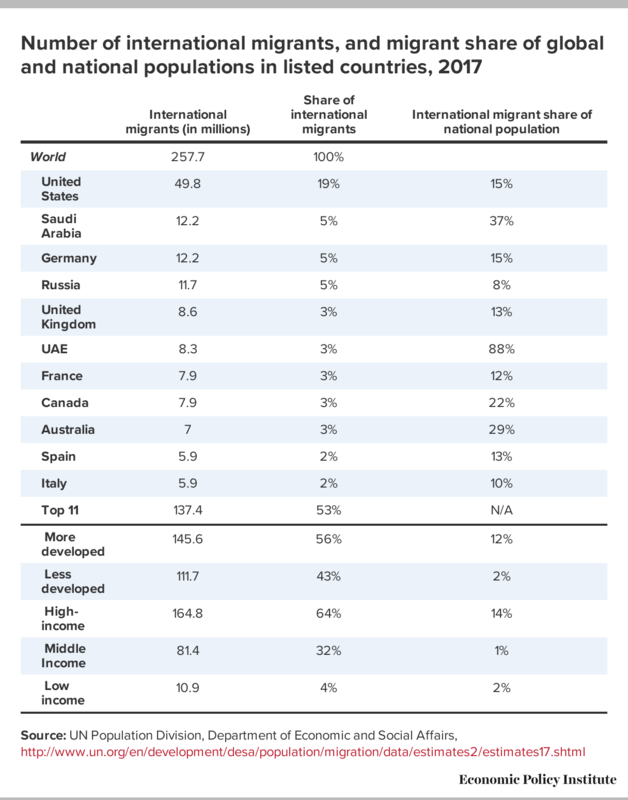 The highest shares of migrants among the national population were in Gulf oil-exporting countries such as the UAE, with 88 percent, Kuwait with 76 percent, and Qatar with 65 percent. 30 percent of Switzerland’s population are migrants, Australia 29 percent, Canada 22 percent, and the United States 15 percent. Countries with fewer than one percent of migrants in the population include Mexico, Brazil, the Philippines, Vietnam, and China.